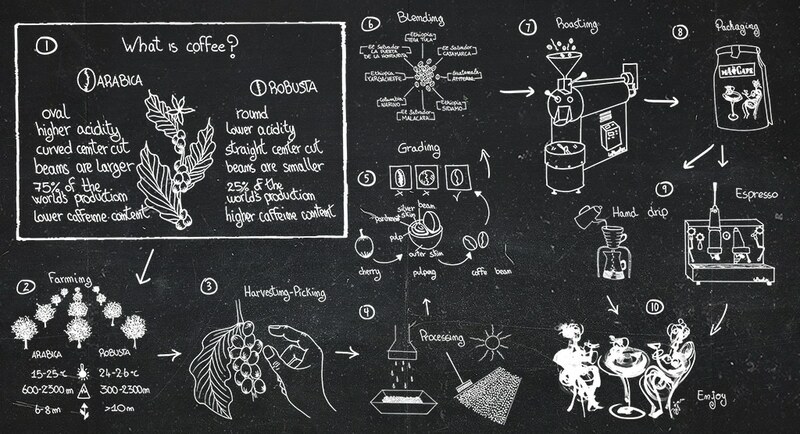 But do we know a lot about coffee, do we know enough, or are we satisfied with our knowledge? I decided for myself that I want to know more about coffee. Although coffee is my business, my job and more than that: my passion, and not to forget: the thing that enables me to fill my fridge, I sometimes catch myself that there are some tiny lacks in my coffee knowledge. One could say: OK, it is not necessary to know everything, but I say: OK, not everything but most of it and that what I know must be based on reliable information. Some weeks ago, when I attended the TriestEspresso, I had a nice talk with some professionals from the coffee business. We had a joint dinner and talked about, guess what? Of course coffee. I recognised that each of us had a lot to tell about coffee but we also had topics we discussed about because we disagreed. I remember the topic coffee roasting, that was like talking about a myth. We all new what it is, how it works and so on. But nobody exactly new the details about the procedure. I knew quite a lot because in my company we actually begin to sell coffee roasters. During this discussion I decided to write a coffee story, beginning with the plant and ending with the preparation of a great cup of coffee. I decided to divide it in chapters, so you can choose to read the whole story or just that parts you’re really interested in or those parts you think you want to learn more about. Then I decided to publish it here in my blog. I plan to publish one chapter every fortnight or every month. Please don’t get mad on me if a chapter takes more time to be published, you know: good things are worth waiting for and I really want to dive deep in the coffee story, so there’s a lot of effort to investigate the details. I hope you’ll love the coffee story and will enjoy it. If you don’t want to miss a date I publish a new chapter, subscribe to my newsletter on the right panel or in the bottom section. You’ll be informed immediately when the new chapter is online.